A balanced footing which is also called as strap footings consists of two separate footings connected by a strap beam. 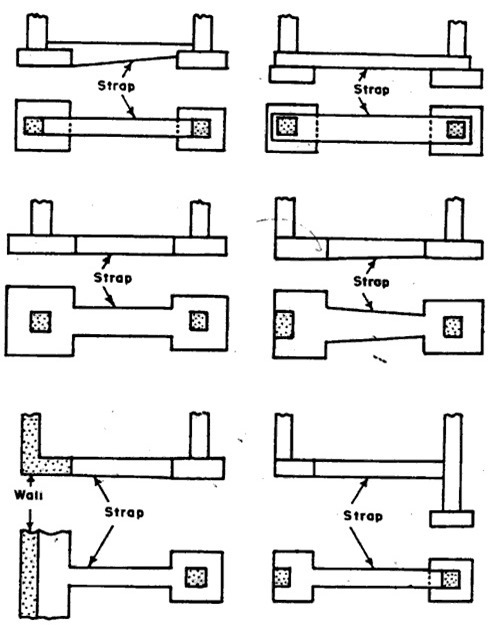 Balanced footing is required where the one of the footing has limited space for bearing, or if there is any restriction over the transfer of pressure from the footing to the ground. This case may arise where there is difference in soil bearing capacity, or loose soil beneath one of the footing. The loads in a balanced footing is transferred from one footing to the other by means of cantilever action, thus it is also called as a cantilever footing. Balanced footing is different from a combined footing in the sense that a combined footing has a single footing and a balanced or cantilever footing has two separate footings which are connected by a strap beam. The strap beam transfers the loads from external footing to the main footing by means of cantilever action. 1. When the foundation does not have sufficient area to transfer the loads safely to the ground, such as in case of footing built on the property line. It is also used when the soil supporting the foundation does not have enough bearing capacity to transfer the loads safely and area of the footing cannot be increased beyond the limit. 2. When the new structure is built near the existing building or structure, and the existing building cannot support the loads from new structure, then new column and footing has to be provided near the existing structure, but there will be limited space for footing. 3. Combined footings can also be used for supporting two columns, but when the distance between the two columns is very large, it becomes uneconomical due to large bending moment to support two columns on a single footing, then a strap beam is used for connecting such footings. In balanced footings, center of gravity of loads and footings has to coincide so that the pressure on the foundation is uniform. In case of cantilever footing, since one of the column is supported by a cantilever action, the center of gravity of loads and footings may not coincide and thus pressure on foundations may not be uniform. The balanced footings and cantilever footings are designed by balancing the loads on the footings through addition of dead loads on the internal column. In case when the fulcrum is near the internal column, the internal footing may be very heavy. The strap beam connecting the two footings are designed based bending moments due to external and internal column loads and as a cantilever in case of cantilever footings.